Since our inception, we are occupied in wholesaling, trading, distributing and supplying finest quality Plastic Strapping Dispensers that are similar to DF-9-C but equipped with tool/seal tray. Our offered strapping dispenser is manufactured with excellent grade material keeping in mind the market norms. The strapping dispenser offered by us is checked on varied parameters for supplying fault free range. Furthermore, customers can avail this strapping dispenser in different specifications as per their needs. 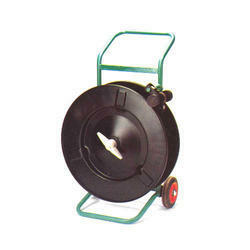 Standard strapping dispenser suitable for heavy-duty plastic strapping. solid rubber tyres. Strap over-run brake and guide rollers. Similar to DF-9-C but equipped with tool/seal tray. Equipped with a strap guide roller and soft stop’ start brake system for high-speed strap feeding in automatic machines. Lightweight and portable with carrying handle arid strap over-run brake. Our firm has successfully expanded its business in market due to the offered elevated quality array of Steel Strapping Dispensers. These strapping dispensers are equipped with coil of mill wound and coil of ribbon material. This strapping dispenser is manufactured from the best in class material & modern techniques in adherence with the set norms of industry. Offered strapping dispensers are provided in various specifications as per the requirements of the customers. Standard strapping dispenser suitable for almost all strapping departments equipped with solid rubber tyres for easy mobility. Simple and easy strap coil reloading. As for Model DF-9 hut equipped with tool tray for stowage of strapping tool, cutters and other ancillary equipment. Equipped with an additional strap guide-roller and strap dancer arm for smooth. high-speed strap pay-out in automatic power strapping equipment. A horizontal dispenser with left- or right-hand strap pay-out. For strap gauges over 0.6 mm a dispenser cover (OWM 0273) is required. The dispenser can be easily located under work tables or a conveyor to save space. Suitable for overhead location, where floor space is at a premium. strap feed to operators from overhead. Dispenser can be mounted on optional suspension unit for max, 75 kg. As for Model DO-3A above, hut suitable for ribbon-wound strapping only. This dispenser is similar to Model I)F-IORW but has no tool tray attachment. Equipped with tool tray. The dispenser is suitable for ribbon-wound. The four solid rubber tyres give good mobility, with a tool tray. and a spare strapping coil holder. 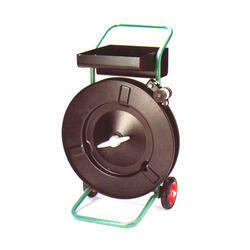 Two ribbon-wound coils can be loaded into the dispenser ready for use, equipped with solid rubber tyres. Looking for Strapping Dispenser ?